While “word-of-mouth” or “referral” marketing may have been sufficient in the past, the majority of top law firms today are taking a much more strategic approach to their marketing efforts. In order to be competitive in the saturated personal injury law industry, many attorneys have made the smart move to outsource a lawyer marketing agency that can promote their legal services to a target market. Delegating part or all of your legal marketing to a professional marketing agency can do a lot to improve your business. However, it is vital that you are highly intentional and selective in the hiring process. The same care should be devoted to choosing an attorney marketing agency as the employees who work at your firm every day. Whether you realize it or not, your agency will play an influential role in your legal practice and their performance will have a direct impact on your firm’s success rate and public image. If you’ve decided to outsource your law firm’s marketing, how do you find an agency who will be sure to rise to the challenge? By asking the right questions. 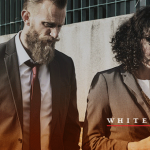 Whitehardt, an attorney advertising agency in Nashville, is one of the few major league players when it comes to lawyer marketing. 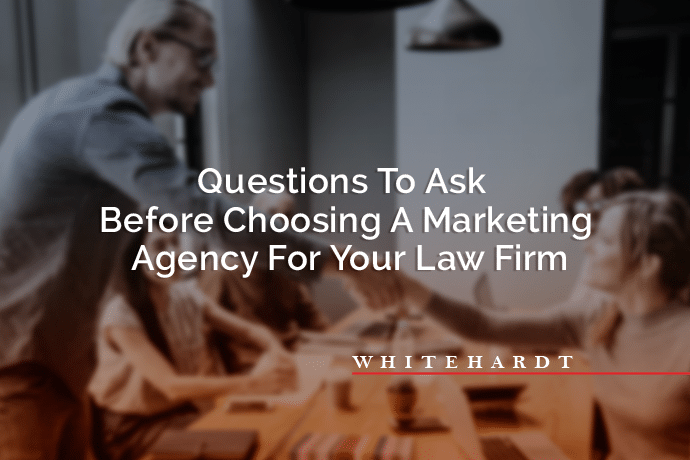 We have more than a few words of wisdom to help you ask the right questions and find the marketing agency that best fits your firm. First and foremost, do they specialize in attorney advertising? While this may sound obvious, there are tons of general marketing agencies out there that represent clients in a wide variety of industries. It’s important to ask this question up front because you don’t want to end up with an insufficient marketing agency that isn’t familiar with your specific field. Instead, you want to hire industry experts who understand the peculiarities of your niche. Do they have knowledge of legal ethics and state bar rules? Speaking of industry peculiarities, attorneys have to adhere to state bar rules when it comes to advertising. While some states are stricter than others, your marketing agency should have hands-on knowledge of the rules governing your state. What do they know about your competitors? Competitor research is an essential factor in any industry. The agency you choose should have a solid understanding of who your competitors are, what they’re doing and saying, and what you can do to stay ahead. Do they have the resources necessary to make you a strong competitor? Commercials, digital marketing, website design, content marketing, search engine optimization (SEO), Pay Per Click (PPC), the list goes on. 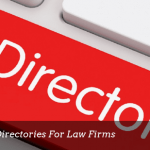 There are many individual pieces that make up a successful marketing campaign for attorneys, so you need to ensure the agency you choose has the resources and manpower to effectively execute in each area. It’s difficult to be an expert at every strategy under the marketing umbrella, so if you’re interviewing an agency that is a one or two-man show, consider it a red flag. Even if they are very knowledgeable, chances are they won’t be able to handle all the distinct components of your campaign with only two people. Instead, look for an agency with a team of individuals who are highly-trained experts in their specific areas of marketing. Are they a stable firm that’s going to be around long-term? Let’s return to the example of the one or two-person agency. They may be smart, hard-working individuals but if their agency shows no sign of growth or stability that can sustain their business long-term, you probably don’t want to hire them. Instead, look for an agency that you can count on for the long haul. A good agency will establish a relationship with your firm that may even start to feel like a friendship because you have developed such a lasting partnership. Plus, the stronger the relationship you have with your agency, the better they will understand your law firm’s mission. Who will be providing the service or creating the product for you? Are they qualified? Many attorney marketing companies have a team of people whose sole job is to “sell” their services to you. While there’s nothing inherently wrong with sales, attorney marketing agencies with a strong sales culture can start to sound like a used car salesman who will say whatever is needed to get you to sign the dotted line. Ask the question above to push past sales jargon and learn more about the people who will be creating and implementing your marketing strategies. Take it one step further and ask if you can speak to those team members directly. This will help you avoid falling prey to misleading sales pitches. How do they measure success? Before hiring a marketing agency, you need to know how they measure the success of their services. At Whitehardt, we don’t just make the phone ring. We analyze and improve every aspect of your firm to ensure you’re performing at peak efficiency. How do we do that? With our CFO, Felix Eckhardt’s in-depth, data-driven approach. The “hardt” in “Whitehardt,” Felix has helped over 60 law firms raise their bottom line. With his guidance, our clients seamlessly maintain consistent and manageable caseloads. To help monitor the workflow of his client’s caseloads, Felix developed a data-based management tool called the “Flag Report.” The data from the Flag Report provides weekly insights into how many calls your firm gets, how many of those calls turned into leads, all the way to your firm putting money in the bank. This comprehensive performance report each week makes it easy to identify potential problems. Additionally, these metrics can be compared with other law firms and help you implement new strategies. Completely unique to Whitehardt, the Flag Report is an invaluable tool that has made a huge difference in our client’s firms. With proven tools like the Flag Report and Whitehardt’s years of experience helping law firms across the country, you can improve virtually every aspect of your firm. At Whitehardt, we create ads and marketing strategies that will generate leads and grow your firm. However, we take that a step further by optimizing daily operations, improving your client communications, and helping your staff convert phone calls into cases. This investment in your firm’s overall success is what makes our agency unique and valuable to law firms. Our team is built of savvy professionals who are constantly innovating and working to get our clients better results. If you’re searching for great ads, smart online marketing, more profits, and better cash flow, Whitehardt can help. Call our Nashville office today at 615-577-1010 or complete our inquiry contact form to learn more about how we can impact your law firm.